It’s not often that I venture around town in the middle of a work day but since I was on my way to meet the agent of our new apartment, why not grab a sunny day shot instead of worrying what I can photograph later in the day when it’s rather late and all dark outside, right? Seems like the city council of the 5th arrondissement is also trying its best to decorate the neighbourhood up a little. 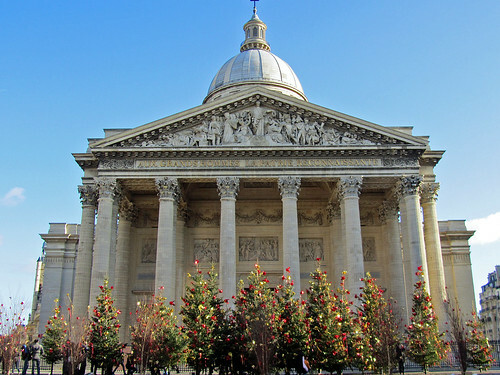 In front of the Panthéon tens of Christmas tree prettied up using red and yellow ribbons, while just across the street, the city hall itself has silver tinsels streaming along the height of the building. Rather impressive, I must say. wet weather? sky looks blue!!! in any case, chloe reported “raining cats and dogs” around lunch time, and then sunny blue sky about an hour after that! crazy weather all round. at least it’s not snowing here (as opposed to dublin), hehehe.